Medical research has proven the effectiveness of Feverfew in decreasing the frequency and/or intensity of migraine headaches when used on a daily basis. Also relieves some of the accompanying symptoms such as nausea, depression, and arthritic pain due to inflammation. Effective in the relief of occasional simple headaches, acute and chronic migraines, and cluster headaches. Headaches can have many different underlying causes. In addition to using this compound the source of the headache should be sought. OS-15 comes in 1 oz. (30ml). Using 30 drops per day this bottle will last about 1 month. Acute: For best results, begin use at first sign of headache. Initially, 15 to 20 drops in water. If headache persists or returns take 10 to 15 more drops, depending on severity, up to five times per day. Chronic Migraines (extended therapy): 10 to 20 drops in water, two to three times per day. Full results may be obtained by extending therapy for 4 to 6 weeks. Feverfew is contraindicated during pregnancy because of stimulating action on the womb. Severe, long-lasting, or frequently recurring headaches may indicate more serious illness. Seek the advice of a qualified healthcare practitioner. 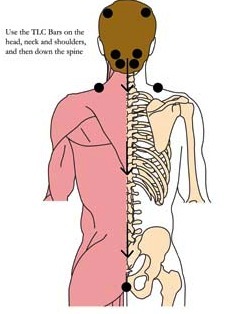 Location: Cell Point A is located below the base of the skull, in the hollows on both sides of the spine. Benefits: Relieves headaches including migraines, dizziness, stiff neck, neck pain, neuromotor coordination problems, eyestrain and irritability. 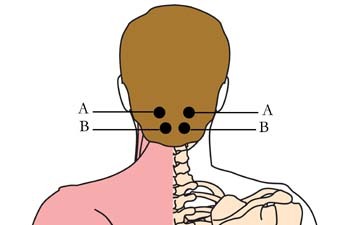 Location: Cell Point B is located one half-inch below the base of the skull, on each side of the spine. Benefits: Relieves stress, burnout, exhaustion, heaviness in the head and stiff neck. 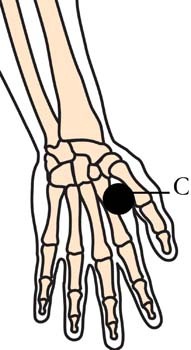 Location: Cell Point C is located on the back of the hand, in the webbing between the thumb and index finger. Benefits: Relieves frontal headaches, indigestion and shoulder pain. Caution: This point is forbidden for pregnant women as the stimulation may cause premature contractions. Duration: Start Cell Point application when you begin using OS-15. Continue wearing the Micro-Disks for two to three hours after symptoms have cleared. Reapply at the first sign of imbalance.